Jason Anderson after taking Husqvarna’s first Supercross win at Anaheim. For anyone remotely familiar with the history of off-road racing, the Husqvarna brand is iconic. In the U.S., perhaps the brand’s reputation began with video of Malcolm Smith on his Husqvarna in the movie On Any Sunday. Nevertheless, Husqvarna had never won an AMA Supercross main event in the Premier Class (either 250cc two-strokes or 450cc four-strokes). That changed Saturday night in Anaheim at the opening round of the 2016 Supercross series. Jason Anderson piloted his Husqvarna FC 450 to the checkered flag and the top step of the podium. This was not only an historic occasion for Husqvarna, it was Anderson’s first win in the 450 class. While Husqvarna floundered a bit under BMW ownership, the sale of the brand to Stefan Pierer in early 2013 was a turning point. Pierer, an owner of KTM, immediately began to share technology and hard parts between the two brands, turning Husqvarna into an AMA racing force to be reckoned with almost overnight. 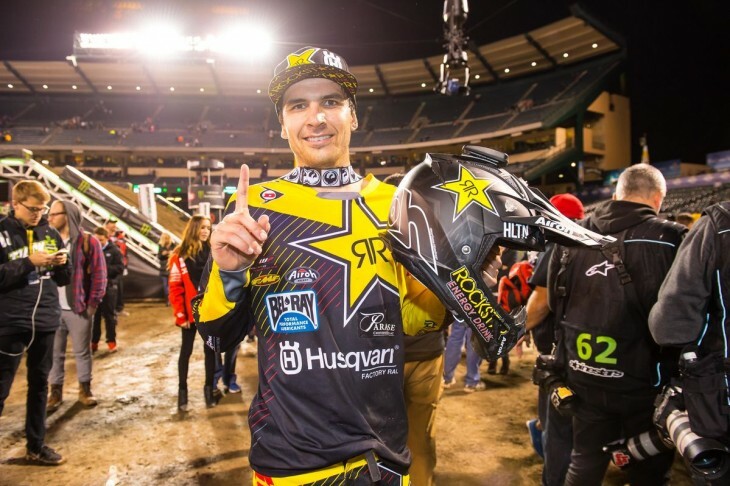 January 9th, 2016 will forever hold a place in Husqvarna history as Jason Anderson took home a monumental win at the first AMA Supercross round in 2016, held at Angel Stadium in Anaheim, California – a career first for both himself and Rockstar Energy Husqvarna Factory Racing in 450 SX competition. To add to an already historic night, Zach Osborne and his Husqvarna FC 250 race to a 3rd place podium finish. Jason Anderson has found a new level this season. He has regained his focus with a strict training regimen, and is reaping the rewards as a result. He earned a quick transfer to the 450 main after moving from sixth to second in his 450 heat. In the main, Anderson pulled a third-place start and was looking aggressive. He started to focus on moving through the ranks, but was halted after a red flag in the second lap due to a down rider. Anderson was mid-pack on the restart, and immediately started moving ahead. Looking determined and committed, he flew through the pack before making the pass for second in lap eight. He moved into the lead on lap 13, and held strong to the finish. The historic Anaheim 1 450 win marks his first in his career, not to mention the first-ever 450 win for Husqvarna. The red plate with now grace his Husqvarna FC 450 at round 2, next Saturday in San Diego. Zach Osborne was off to a great start in his 250 heat race and fought his way to the lead by the end of the first lap. He dominated the heat and took home the first heat race win of the 2016 season. He pulled a mid-pack start in the main and immediately starting making passes to move up the ranks. He was on the move early in the race before settling nicely into the third-place spot before taking home his first podium of the season. Christophe Pourcel took 1st gate pick in Heat 1 after setting the 2nd fastest overall time in qualifying practice and finished seventh in the heat after a mid-pack start and would eventually qualify for the main through the semi. He moved up to fifth in the main before moving back through the pack and finishing 18th. As an independent manufacturer, Husqvarna closed down in ’87. The rest is another story, more a story of branding than anything connected to what used to be the Swedish Husky. Cagiva in particular showed how difficult that route can be, to a certain extent the same goes for BMW. Now, as a part of the KTM empire, the branding excercise perhaps has a chance of some success. However, the Husaberg story show the hard facts, so perhaps Husqvarna will survive as a brand for a couple of seasons at least. Way back in 1987 Cagiva purchased Husqvarna. Some of the engineers didn’t want to go to Italy, so they stayed behind and started the Husaberg brand using Husqvarna technology. In 1995 KTM purchased Husaberg and used their technology to help make the KTM machines what they are today. In 2013 KTM purchases Husqvarna and in 2014 discontinues Husaberg. So, is the current Husqvarna mostly KTM or Husaberg? The answer is: It is both. Bryan Kenny won the first Supercross in Daytona in 1971 and I believe he has on a Husky. Considering the strength of the field, that was helluva ride by Anderson. I wonder how Stewart would have done had Wrong-Way Dungey not taken him out. Do they not penalize the number 1 plate? Also, I see no chrome on that tank. Therefore, not a Husky. The article states 250cc or 450cc four-strokes. Travis Preston won a 125cc (two-stroke) main around 2001. Congrats Jason and Husqvarna! I’m glad to see the European bikes come back on line and be so competitive. Now only if Bultaco (yea, I know they’re back in business, but only with an electric bicycle for now) and some others were back and on the pipe! Montessa never left, but now only serves us with a Honda owned trials bike. Never the less, glad they are still here. The 450 class is overflowing with guys that can potentially win.Its going to be a great season! Awesome! Kent Howerton is smiling! Way to go, Jason and Husqvarna!